St. Stephen’s has a food barrel in which we collect non-perishable food items for distribution to the hungry. We have a basket under the ushers’ table at the entrance of the church, and we ask that you bring food offerings to the Sunday service that you attend and place them in the barrel. During the week, the food barrel is located in the narthex. Some appropriate items are pasta, canned vegetables, canned fruit, dried fruit, soups, cereals, peanut butter, rice, beans, powdered milk, coffee, tea, and canned tuna. Food is collected primarily for Apostles’ House, a transitional house for the homeless in Newark, which last year served over 14,000 clients. St. Stephen’s, in partnership with local high school and Girl Scout troops shares in the work of providing meals at the Soup Kitchen housed at Holy Trinity Church in West Orange. Three or four times a year St. Stephen’s hosts the meal. This involves preparing meals and providing all the extras in order for individuals in West Orange to enjoy nutritious food and warm fellowship. Hosting on a Saturday means handling set up and preparation from 10:30 am to noon; serving guests at noon; and then cleaning up after 1 pm. Each Saturday approximately 80 guests are served. This is a meaningful activity for families to undertake together. This is an ecumenical ministry to homeless families of Essex County. The Director of the Essex County IHN works with churches and synagogues that are members of the network. Each participating congregation houses three to four families in their buildings for a week or two each year. The families move each week to another host church or synagogue until they find suitable housing. The Network Director screens and selects the families, who are referred by the Legal Aid Society, Welfare, and other social agencies. She guides them in their search for housing, job training, and employment. This outreach project involves 50 or more parishioners during each hosting week and affords opportunities for everyone to help. Some volunteers stay in the Parish Hall overnight with the guest families. Others prepare and serve meals, move cots and belongings, do laundry, play with children, and make monetary and food contributions. There also is the opportunity just to be a friend to another or to offer a listening ear. St. Stephen’s hosts IHN guests during the vacation weeks for the Preschool. The North Porch Women and Infants’ Centers, a project of the Episcopal Churchwomen in the Diocese of Newark, provide emergency seven-day supplies of formula, baby food, diapers, clothing, bed linens and other supplies for needy mothers and infants in the Newark, Paterson, Dover and Clifton areas of northern New Jersey. Besides maintaining a collection box throughout the year for donations of baby supplies, on two occasions St. Stephen’s holds a “Baby Shower at Coffee Hour” to focus attention on the need for contributions. Parents of St. Stephen’s Preschool also contribute to this project. In the spring of 1858, one of the founders of St. Stephen’s Church, Israel Dodd Condit, gave the church eight acres of land for a cemetery, and the site was consecrated for that purpose in October of that year by the Bishop of New Jersey, the Right Reverend George W. Doane. The cemetery was established as one for the community, open to those of all faiths, and in the ensuing century and a half has become a resting place for many who have played significant roles in the history and culture of Millburn Township and its environ. A mausoleum, The Chapels at Short Hills, was opened in the cemetery in 2003. 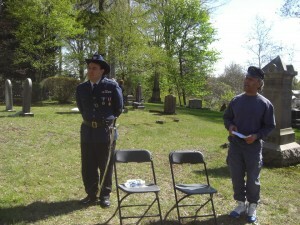 Tours of the cemetery, in which impersonators stand at selected grave sites to speak for the persons buried there, have been offered periodically since 2008. In addition to people who were prominent in governance and development of the township in its early years, tours have featured a leading broadway actress, a well-known opera singer, an Episcopal Bishop who was a major church leader during the Civil War, Civil War veterans, World War II soldiers killed in action, and many others with township connections who lived interesting and productive lives. Advance notice of future tours will be posted on this website. 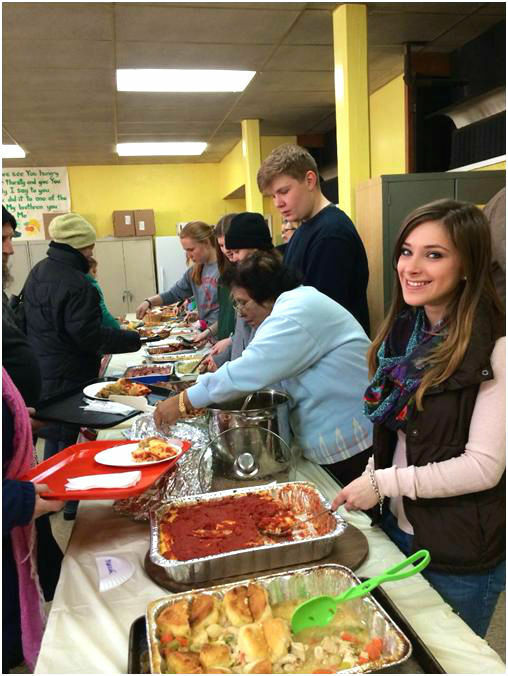 Each year during Thanksgiving season, community agencies in Essex County distribute box dinners to families in need. Parishioners are encouraged to donate a box dinner containing all the ingredients needed to prepare a festive holiday meal for a family. Parishioners are asked to sign up in advance so that St. Stephen’s may advise the agencies of the number of dinners to be provided. Lists of menu items to be included in the box and a sign-up sheet are made available to donors during coffee hour about three weeks before Thanksgiving. Members that wish to be involved but are unable to shop themselves may make a financial donation. 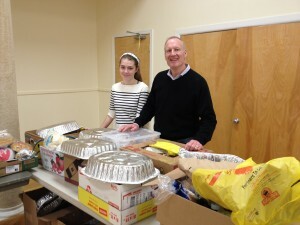 Youth group members shop for the dinner ingredients and assemble those boxes. Turkey dinners are collected in the Parish Hall on the Sunday before Thanksgiving. In addition to donating box dinners, drivers are needed each year to make deliveries to the agencies. Parishioners may volunteer for delivery service when signing up to provide a dinner. For a number of years, St. Stephen’s has worked with social service agencies to provide Christmas gifts for needy families in our area. Parishioners who participate in the Angel Tree project may elect to provide gifts to an individual or to an entire family. Guidelines for appropriate gifts are provided. Beginning on the last Sunday in November, members of the parish are given the opportunity at coffee hour to take paper angels on which the first names of children and adults are written. 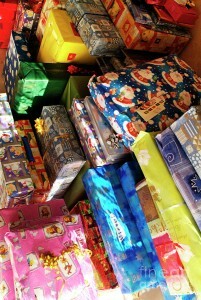 Gift collection is at the coffee hour on a Sunday in mid December. In addition to bringing gifts, parish members may assist the coordinators with the sorting and distribution of gifts. The Mission to Seafarers’ frontline staff are there for seafarers in trouble, distress, or despair. Piracy, shipwreck, abandonment and separation from loved ones are just a few of the problems merchant seafarers face. St. Stephen’s parishioners have knitted hundreds of scarves and hats as gifts for seaman entering Port Elizabeth. If you are interested in being part of the knitting team, patterns can be downloaded here. Wool donations are also accepted to help keep our knitters busy throughout the year.